Berlin is a city ripe for discovery. A sprawling metropolis stretching over nearly 900 square kilometres, and comprising of twelve separate districts, each with their own flavour, there are several weeks worth of things to do in Berlin and first time visitors may be a little overwhelmed by what to take in. 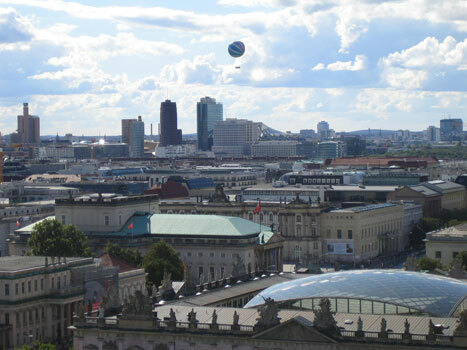 Should one begin in Mitte, and visit the famous Alexanderplatz, before strolling down the majestic Unter den Linden to Brandenburg Gate, and the Reichstag? Or maybe one should start by taking in the scenic parkland of Tiergarten, and pay a visit to Knut and other celebrities at the Berlin zoo? Or yet again, why not revel in the finery of Charlottenburg with shopping on Kurfurstendamm, or a trip tp the Schloss Charlottenburg Palace? Meanwhile history buffs will be torn between exploring the dark legacy of the Third Reich and the still visible scars of Communism, including of course the most famous symbol of the Cold War - the Berlin Wall. Further out of the city, sunbathing and picnicking opportunities abound in the beautiful lake districts out West... And of course there's the famous Berlin nightlife to explore, now considered hipper and edgier than that of Ibiza and Miami! Rather than put their faith in chance - and dodgy map-reading abilities - many visitors will prefer to take a guided tour of Berlin and get a much better insight into the city with the help of knowledgeable local experts. Berlin tours come in all shapes and sizes in fact, from traditional open top bus tours, to more rigorous bike tours (which are proving very popular with backpackers), limousine tours (for those who fancy some VIP treatment) and on a sunny day what better way to see that city than on a Berlin boat cruise on the river Spree? Of course you could stick to those instruments which nature endowed you with, and opt for a good old walking tour of the capital! If you're stuck for ideas, here are some of the most highly recommended tours and tour providers in Berlin to whet the imagination. These established gurus of tourism offer the widest range of trips and excursions in Berlin, from walking and bike tours to river cruises and pub crawls. They also offer a number of specialised interest trips, so if you want to get to grips with Communist or Nazi Berlin then get in contact.